My best friend's dad owned it in the early to mid-60's, Mr. John McAuley. I remember going there every Saturday and Sunday and working the concession stand. We watched every Elvis movie at least 8 times a weekend, and there was a movie out with Chubby Checker and Gene Chandler. Everyone was dancing in the aisle to the music. It was a great time! When we got tired of being around everyone, we could go up to the cry room and watch. There were fumes of some sort, but no one was hurt. Still trying to figure out what year that was. Going to go to public library for old Flint Journal stories. Around 1963-64 I worked as a ticket girl at the Kearsley Theater. I''d also help Dennis Bouchard behind the concession stand. A couple time a night Dennis would have to go into the show room with his flash light and break up the couples. He hated doing that but we''d get a good laugh at just who he''d break up. Times were different back then, do kids still try to kiss at the movies?Mr Stephens from the High School ran the movie theater back then, I don''t know who owned it when he left, I no longer worked there and was real sad to see it shut down. It was a part of our community. Back then every town and berg had a inside theater with a big markee and ticket and flash light personnel. Geez,I can barely remember the Kearsley Theater. it was across the street from Geroge Daly Jr. High school. As a kid in kindergarten school(Weston Elementary School,on Cashin St. off Richfield Rd.
) we went on a field trip to a icecream place near it. This is in 1960 or thereabouts. If memory serves me right,it was once cleared out for some reason,either fumes or somekind of scary movie. If anyone remembers this,refresh my memory. My sister might remember,she and my brother-in-law use to go there while dating. 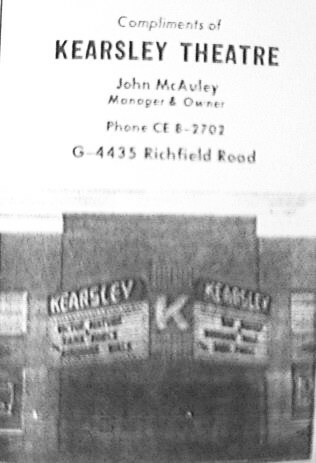 Kearsley Theater since 9/17,04 was purchased by Karen Adams. It is currently being used for catering, banquets/ Weddings. Future goals to retsore many features from orginal design and house dinner theaters and Saturday Movies for children. On September 17, 2006 St. Marks Lutheran Church Celebrated their 50th Church Anniversary at the old movie theatre. Many of the founding members where able to travel to this gala event. St. Marks Luterthan held Sunday Morning Church services in the theater 50 years ago. The facililty continues to be used by many long time patrons when it was a theatre. Paro high school has had it's prom in this location for the last two years and Kearsley Hockey Boosters had a great fundraiser, with Comedian Byran Mccree this October. Many of the Booster Parents had great stories to tell their now teenage children about their movie going weekends in this building. It is awesome to say , it is still a valauble asset to the Kearsley District and Flint Michigan area. The old Kearsley Theatre, is currently being used as a banquet and catering facility. It is called 2nd Generation Grand Ballroom, Meeting and Banquet Center. To get a current view of the interior and updates, log on to www. 2ndgenerationgrandballroom. com. The new owners are interested in restoring the building as much as possible to its original theme of a movie theatre. Currently a Saturday matinee is availbale for children, puppet shows and in the future will host dinner plays and murder mysteries. Any old pictures or theatre artifacts will be greatly appreciated. To date the ticket booth and balcony area is still in tack. Any ony with more information please call Karen at 810-249-6824, The building is still in sound condition for its age. Thanks.